Announcing the 13th Annual Craig Alder Charity Golf Tournament! Craig Alder, the son of retired LAFD (Los Angeles City) Fire Captain Rich Alder and brother of SBFD (San Bernardino City) Battalion Chief Mike Alder, was an SBFD firefighter whose career was cut short when he suffered serious brain injuries after being struck by a car while crossing the street in his home town of Temecula. Family and friends have put together this annual golf tournament for Craig and his family, wife Buffy and two sons Jake and Wyatt, to help ease the financial burden of living expenses plus his continuing care and rehabilitation. Last yearâ€™s tournament was a huge success and we sincerely appreciate the support of the LAFD, SBFD and many other fire departments, friends and families. This yearâ€™s tournament will be held Monday, September 14, 2009 at the Temecula Creek Inn Golf Club in Temecula, Calif. The tournament will be a four person scramble format with a 9:00 AM shotgun start. Men and ladies are welcome and you may enter as a foursome or as individuals. The entry fee is $125.00, which includes golf, cart, banquet lunch and T-shirt. Hole sponsors and tee sponsors are also needed. Entry blanks will be sent to past participants and you may get further information by contacting Mike Alder at (951) 972-7878 or by clicking on the attached documents below. St. Patrick’s Day Parade and Celebration in L.A. The Los Angeles St. Patrick’s Day Parade and Pershing Square Celebration are family oriented events in the heart of Downtown promoting community spirit and civic pride. 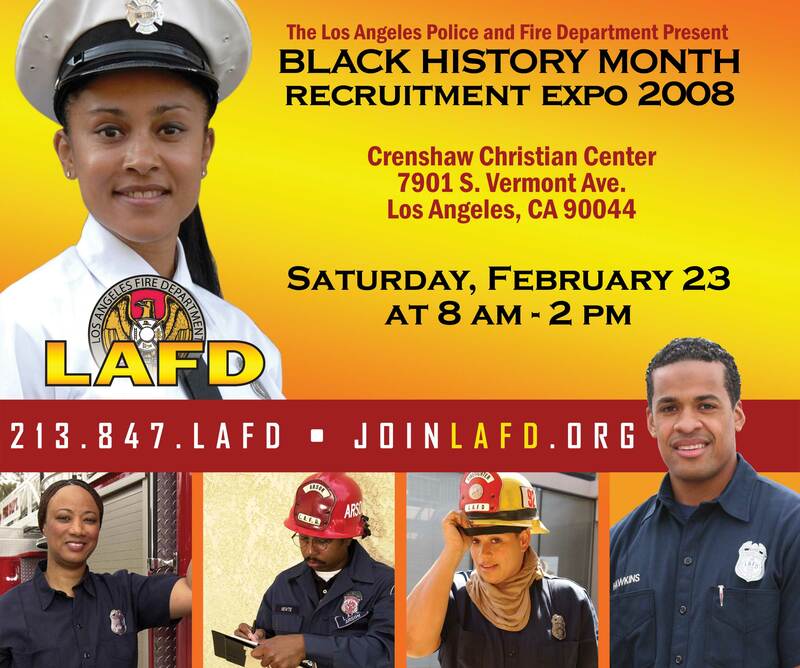 The men and women of the Los Angeles Fire Department welcome you to join them on Monday, March 17, 2008. The Parade will begin at 11:30 AM on Main Street and Arcadia Street, traveling south on Main Street to pass City Hall. The parade continues south on Main Street to 5th Street, where it will turn west to end at Hill Street, near Pershing Square. “Come join the Montclair Fire Fighters Association Local 3608 and Pomona Valley Harley Davidson as we give away an ’08 Fat Boy!! On March 15th, 2008, Pomona Valley Harley Davidson will be hosting the 8th Annual Firefighters Harley Davidson and Hot Rod Show. We will have a pancake breakfast available from 9am to 11am and BBQ in the afternoon hours. Please come join us and show your support and have a good time!! Maybe you thought about becoming a Police Officer or Firefighter, but never followed through. Possibly you know someone with similar aspirations, who never had an opportunity to pursue their career dreams – or maybe you just have questions regarding the work of community protectors. Career Information? Personal Guidance? Individual Interaction? The men and women of the Los Angeles Fire Department welcome you to join Mayor Antonio Villaraigosa, Councilmember Bill Rosendahl, Fire Commissioners, Fire Chief Douglas Barry, City Engineer Gary Lee Moore and civic and community leaders at the public dedication and grand opening of LAFD’s newest Neighborhood Fire Station in Playa Vista.